Before we begin here, a quick program note is in order. Astute readers will note that today is Tuesday. These columns usually run on Mondays or Wednesdays, and are thus posted on Huffington Post and Business Insider as well. But, for the next five months we're phasing out widespread coverage of this column, and phasing in our Electoral Math series in its place. Because the presidential election will be the overwhelming story from now until Election Day, the head-to-head polling between Mitt Romney and Barack Obama will be much more pertinent and newsworthy than our monthly look at how Obama is doing in the "job approval" polling. We don't want to overwhelm and confuse people by running too many charts, to put it another way. During this period, the ObamaPollWatch.com site will host both column series, so you can look there for the most recent of either. And, every month, we'll still be running the Obama Poll Watch columns, it'll just be on Tuesdays and Thursdays, that's all. June was an eventful month for Barack Obama, politically. The unemployment number rose at the beginning of the month, for the first time in a long time. Obama made a big announcement on immigration policy, and he largely won two major Supreme Court battles towards the end of the month. His Attorney General was charged with contempt of Congress (the first cabinet member ever to be thus charged), and the price of gasoline steadily came down, even though it is summer, as the threat of war with Iran fades. At the very end of the month, Obama scored a legislative victory by keeping student loan rates low for another year. All of this meant virtually nothing for Obama in the polls. There were minor daily fluctuations, but throughout the month Obama's numbers stayed so close to exactly even that the "lead" (whether Obama's daily approval average beat, tied, or was beaten by his daily disapproval average) changed six times. He started the month barely ahead, he ended the month barely ahead, and the fluctuations were tiny throughout the whole month, and centered on the turnover point. To put it another way, a month-long tie. 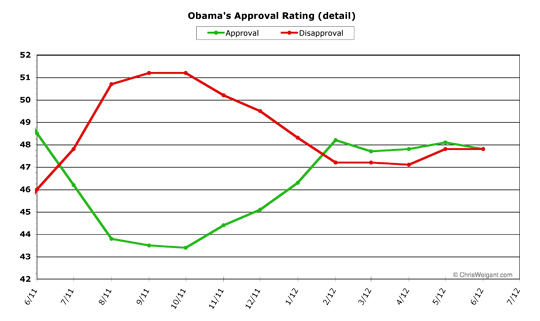 Obama's monthly average approval rating fell three-tenths of a percent this month, to wind up at 47.8 percent. 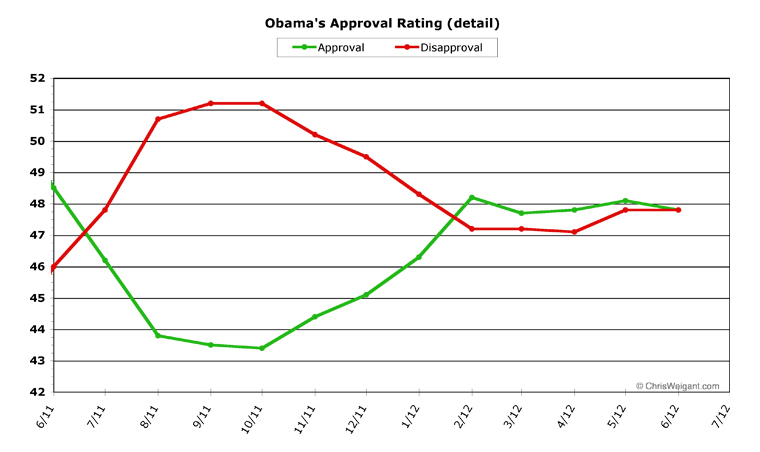 His monthly average disapproval didn't budge at all, and stayed exactly the same -- also at 47.8 percent. For the first month since taking office, Obama finished the month exactly tied. I've used the joke before, here, but the last few months of poll watching have reminded me of Steve Martin's character in L.A. Story, a television weatherman for Southern California, who ends one of his reports with: "Our next weather report will be in four days." The joke, of course, is that Los Angeles doesn't get "weather," but instead has "a climate," making day-to-day tracking pointless. You can barely see the movement, even on this exploded scale. 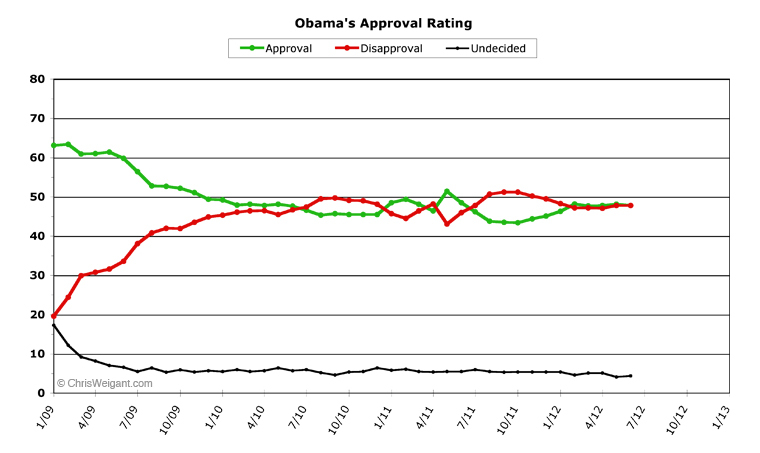 From February until June, Obama's approval rating stays within a half a percentage point. His disapproval fluctuates less than three-quarters of a point. That is remarkable stability, especially for an election year. Unfortunately for Obama, it is still over two percentage points shy of having a majority of the American public approve of his job performance -- the magic 50 percent mark that would make his re-election a whole lot easier. Also unfortunately, the trends, tiny though they may be, don't seem especially good. The amount Obama's numbers fell by in June was the same as he had gained the previous month, which puts his back where he was two months ago, while his disapproval number held on to gains made during the same period. July doesn't seem to have a whole lot of big political news scheduled, except out on the campaign trail perhaps. This Friday's unemployment numbers may indeed set the political tone for the entire month. No huge legislative battles loom which could either help or hurt the president. Which (to end where we began) might mean that the election polling is going to be far more significant next month than Obama's job approval numbers. i do believe i have some quatloos coming my way. fork 'em over guys. CW: All of this meant virtually nothing for Obama in the polls. There were minor daily fluctuations, but throughout the month Obama's numbers stayed so close to exactly even that the "lead" (whether Obama's daily approval average beat, tied, or was beaten by his daily disapproval average) changed six times. He started the month barely ahead, he ended the month barely ahead, and the fluctuations were tiny throughout the whole month, and centered on the turnover point. To put it another way, a month-long tie. Here we are again. No matter what he does, nothing happens to his numbers. No bump for the immigration thing. No meaningful decline for the bad job numbers. No bump for CrapCare (although it's still early). I'll bet we have a long summer of more boring poll numbers. It's so annoying how unreadable this election is. You did indeed call this one right, as I recall. What astounded me was how even in the detail chart it's becoming almost impossible to see any movement whatsoever. Isn't that bizarre, only four months before the election? Isn't this entire election season strange as hell? There's nothing even exciting about it. They're running statistically even, with no drama going on anywhere. And even when when you think there's gonna be some drama — gay rights, immigration, CrapCare — nothing happens. Sheesh. While I'll gladly pay up, I simply have to call foul..
Y'know, I'm starting to hear chatter about the polling, i.e., something is "off." Chris Matthews made a comment about it. The Dem PPP polling place admitted, themselves, that they were off by about 16 points (!!!) on the North Carolina gay-marriage/gay-unions vote and didn't know why, but don't trust national polling on the gay issue anymore. The Wisconsin recall election was totally off, calling it a "tight" race (remember how everyone was saying that we might be up all night; THAT'S how close it was going to be?) when it wasn't even anywhere near it. Typically, I follow Gallup (registered voters, although half of registered voters don't even vote) and Rasmussen (likely voters), because both do daily polling and 3-day averages, and between the two of them, you can get a decent sense of what the national sentiment is. And there's one polling org — Kaiser — that I pay absolutely no attention to anymore. It always sticks out like a sore thumb and reminds me of that polling org that Kos eventually fired, which turned out to be cooking the numbers. But, bottom line, something just feels plain "off" with the polling, in general, as Matthews said. And he's an old political war horse, who's been in the game forever. And he said it just as I was thinking the same thing. For starters, it's not normal for Obama NOT to be getting "bumps" for anything. I think, once you start looking at state by state polls, the numbers won't be very pretty for Obama..
What is it about elitist Leftists that they always have to cap on America??? Tell me.. What's the attraction of slamming down the country that has given them soo much??? heck, i said approval and disapproval would both be within 3 points of 47.5, but i didn't think they'd be within 3 TENTHS of a point! When yer good, yer good.. It's undeniable that he has taken some huge hits this last month or so..
That sounds right. Because, taking everything into account about Romney and about how the Republicans have been acting for the last four years, Obama shouldn't have to worry about not getting bumps in his poll numbers ... he should be head and shoulders above his lame Republican challenger. But, then, when you think about it some more, the polls are not really a reflection of who the candidates are, neither what they have said nor what they have done. No, the polls reflect more upon the electorate, themselves. And, clearly, when 60% of voters who identify themselves as Republican reject the Enlightenment, for God's sake, don't be too surprised when poll results don't look normal! 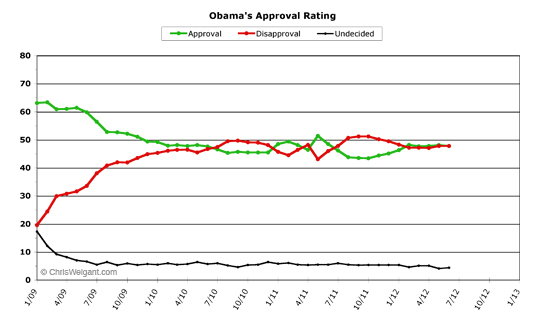 I think Team-Obama's biggest concern should be that he never manages to get above 50% and stay there. And he's not showing very well in a lot of those battleground states, either, as you had mentioned earlier. I'd be getting nervous, if I were Team Obama, seeing as undecideds generally don't break for the incumbent. Hey, no more live camera in your shop? I was keeping an eye on the customers for ya. he should be head and shoulders above his lame Republican challenger. Agreed.. If Romney were as bad as the Left claims him to be and Obama is as good as the Left claims him to be, then Obama should be stomping Romney out of the election..
1. Romney isn't as bad as the Left thinks..
B. Obama is not as good as the Left thinks.. It's perception that is all important..
if I were Team Obama, seeing as undecideds generally don't break for the incumbent. Elections usually favor the incumbent.. This is conventional wisdom that is based on one thing..
"I'll work with anybody who wants to work with me to continue to improve our health care system and our health care laws, but the law I passed is here to stay"
No one had ANYTHING to do with passing ObamaCare..
as i understand such things, the left tends not to think obama is all that good, nor that romney is all that bad. the far left tends to regard obama as a giant disappointment and romney as a weaselly waste of space. some on the left are planning to vote for obama (mostly due to the make-up of the SCOTUS), but few retain any illusions about him being a genuine ally. factually, i'm in no position to know. however, the tea partiers have cried wolf so many times on obama's background, in terms of public perception the the actual facts practically don't even matter. Agreed.. When you DO have the facts on your side, no one listens..
Much like the Bush Bashers of the Bush years. They screamed so much a bout Bush that people just turned them off.. Looking at it in THAT context, I can understand why ya'all would not be interested in more Obama/Forgery points.. But how many of those can one man have in his life before people start wondering??? Who wants to break the news to our public servant that We, the People — his bosses — decide if CrapCare is here to stay; not him. With his AZ semi win and his ObamaCare "win", I bet Obama feels he has locked in his Base support. PLACE YER BETS!!! PLACE YER BETS!!! Well, I was half right..
Unemployment stayed at 8.2, but JOBs creation was dismal. WAY below projections..
you're no dullard michale, and i think if you take a second read you'll see Root mirroring the same economic ignorance he sees in others. there is a world outside the US, and the current economic conditions are much more complex than the picture he's presenting. certainly both the left and the right, private businesspeople and public servants alike, all tend not to really understand the challenges that the others face. but root is propagating more ignorance with his talking points about how ignorant others are. I find it interesting that, once again, Obama is marching to the GOP's tune..
Last time, Obama claimed that the private sector is "doing fine"... GOP pounced on the line and Obama couldn't backtrack fast enough..
Today, in an early campaign stop, Obama claimed that the dismal JOBs number was "a step in the right direction". The Democratic convention is a national coming-out party for Charlotte. But diverse North Carolina is also a harbinger of how the presidential race could go.